Steak Night! – Eat, Drink, and Go! 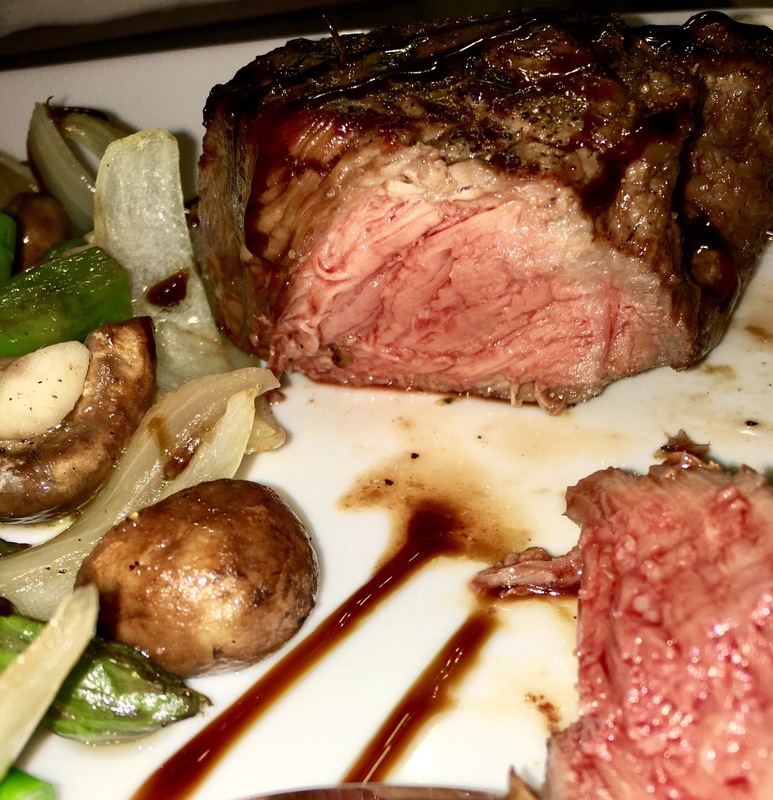 When you’re craving steak, only a steak will satisfy. And that’s what happened last night. I had so much turkey and all the Thanksgiving stuff from last week that I just needed a good ol steak. 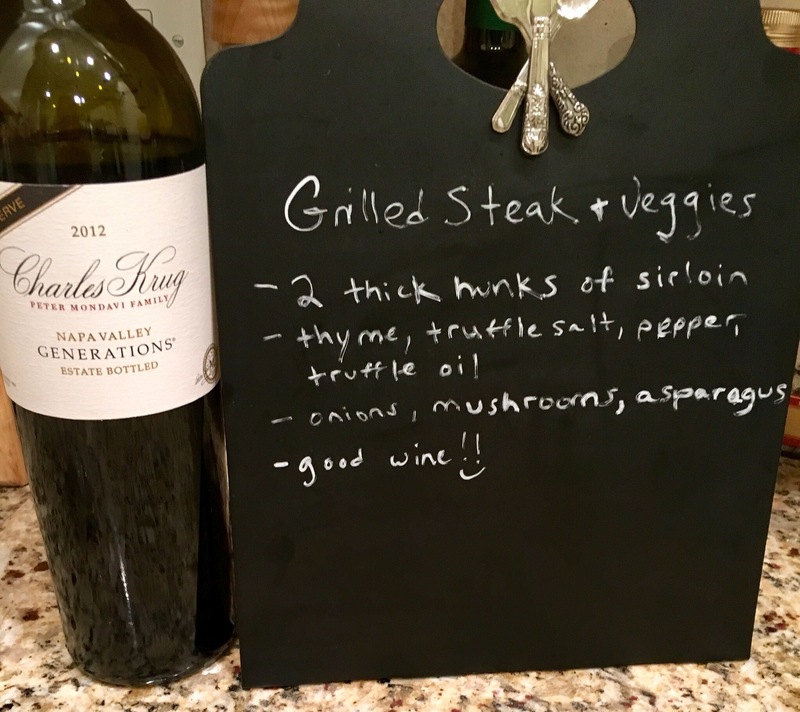 It was a great December evening to grill – chilly, but not too cold to grill up the perfect steak and some veggies. 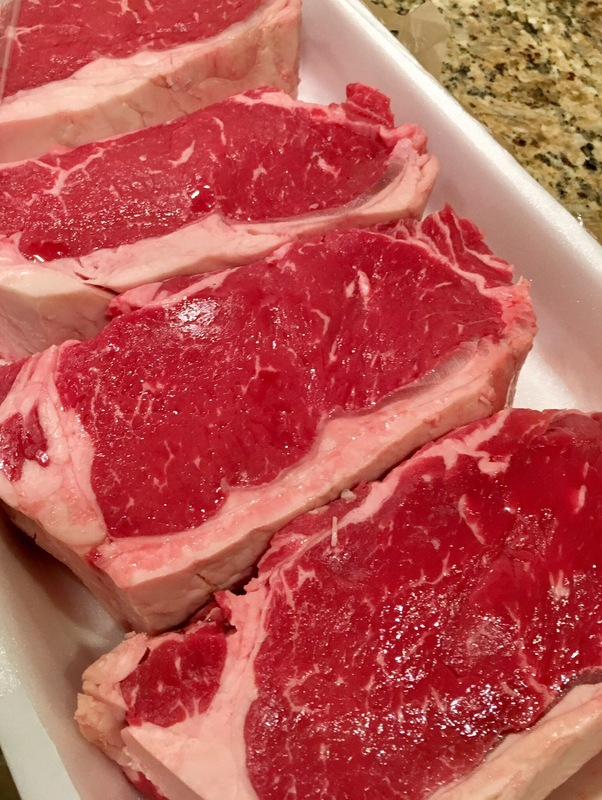 I found some great looking NY Strips at the store – they were so big I had to cut in half to cook because I just can’t eat like I used to (and still fit into my jeans). 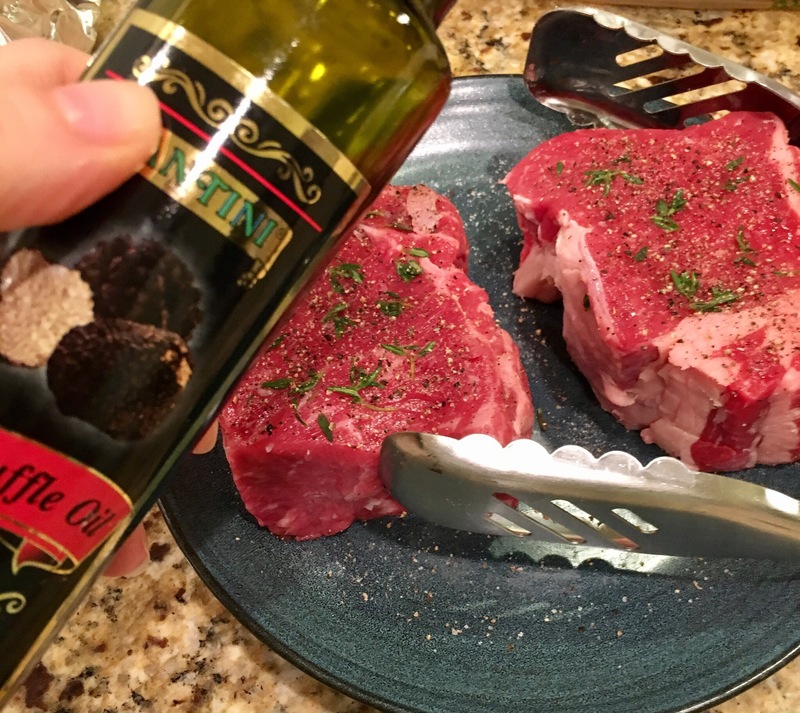 Kept things pretty simple, just seasoned a little bit with thyme, truffle salt and pepper, then a light drizzle of truffle oil just to sear on the grill. 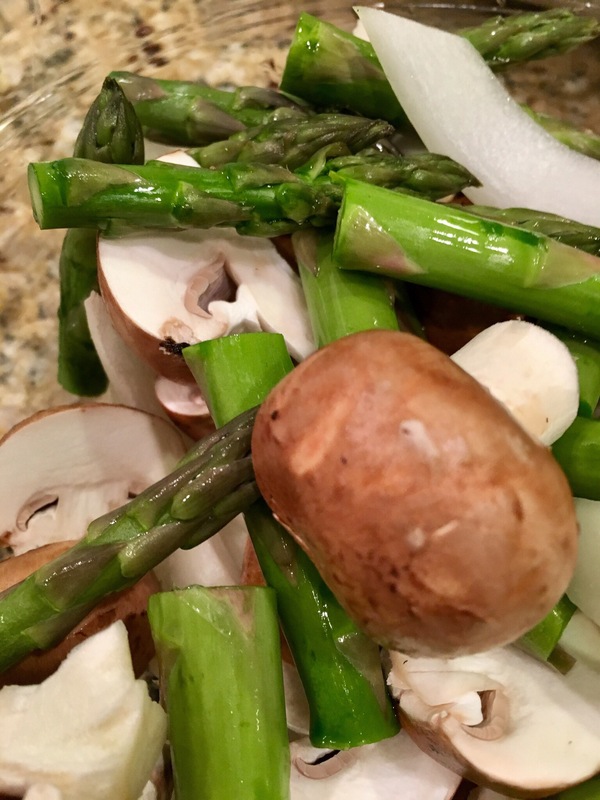 Same seasoning on the veggies – a medley of asparagus, mushrooms and onions in a foil packet. I always grill the smaller veggies in a foil pack so as not to lose any into the fire. Ok, let’s get grilling! 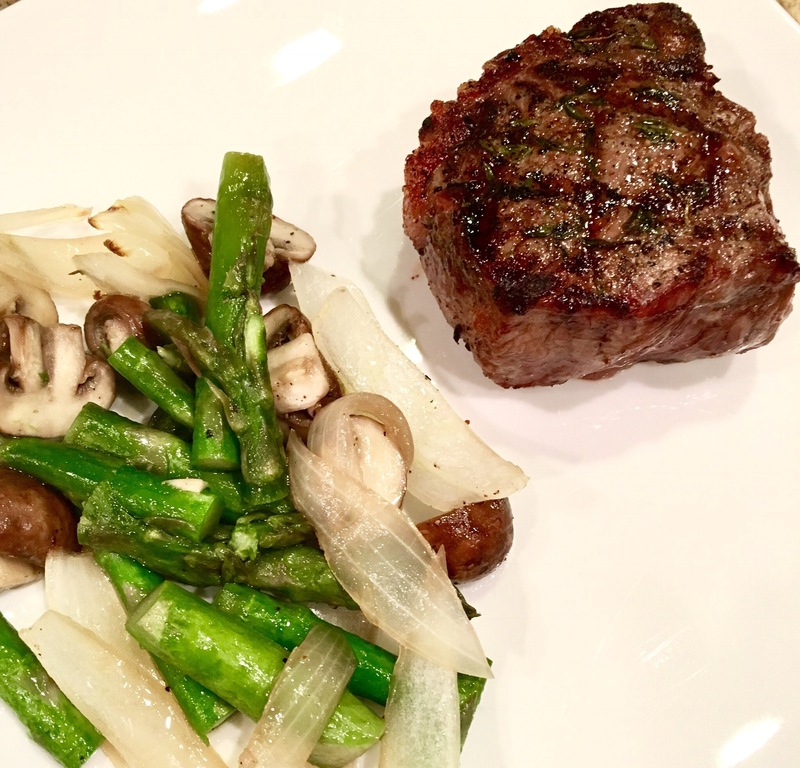 I try not to brag much, ok a little, but I do have a knack for steaks on the grill. I like them rare to medium rare, but this time I was a little scared because this grill is new-ish and I hadn’t made steaks on it before. Luckily things turned out great! The trick to getting good grill marks it to let one side sear, then make a quarter turn and sear. Then flip and do the same. These steaks were extremely thick, so it was about 5 min on each side to get to a medium rare. I feel a strong sense of accomplishment when I see the grill marks. It’s like validation that I can truly grill a steak. 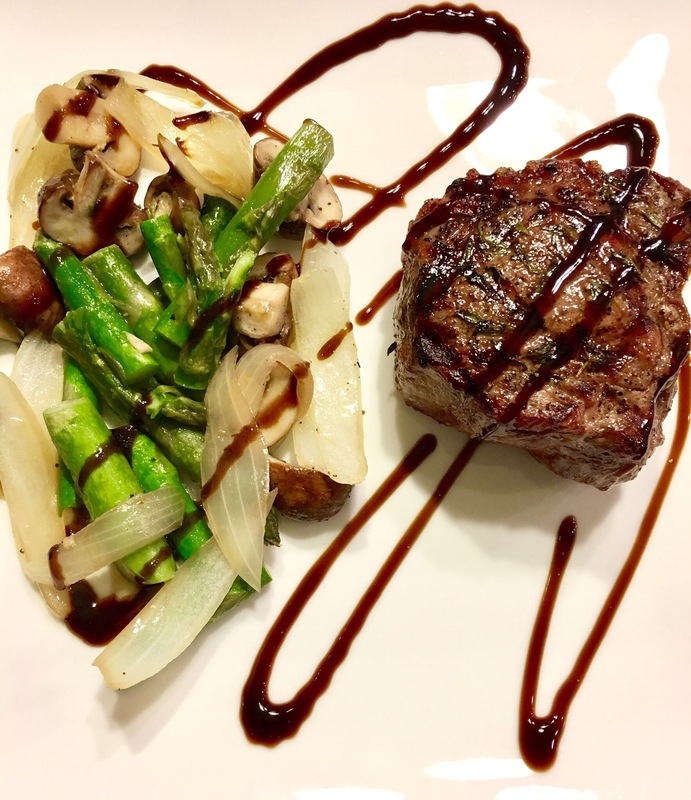 For a little oomph, I drizzled a balsamic truffle glaze on top of the plate. 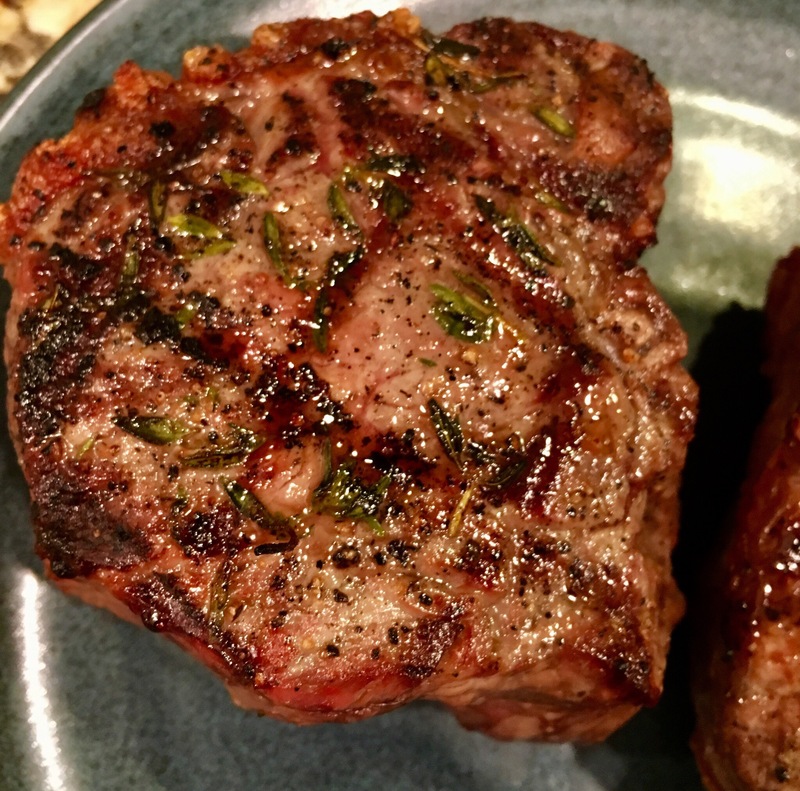 Be sure you let the meat rest just a couple minutes when you finish cooking to seal in the juices, basically the time to plate everything and get it to the table. I cut into the steak to check the doneness and was pleased! This was a delicious dish. Simple and satisfying. Steak craving cured. 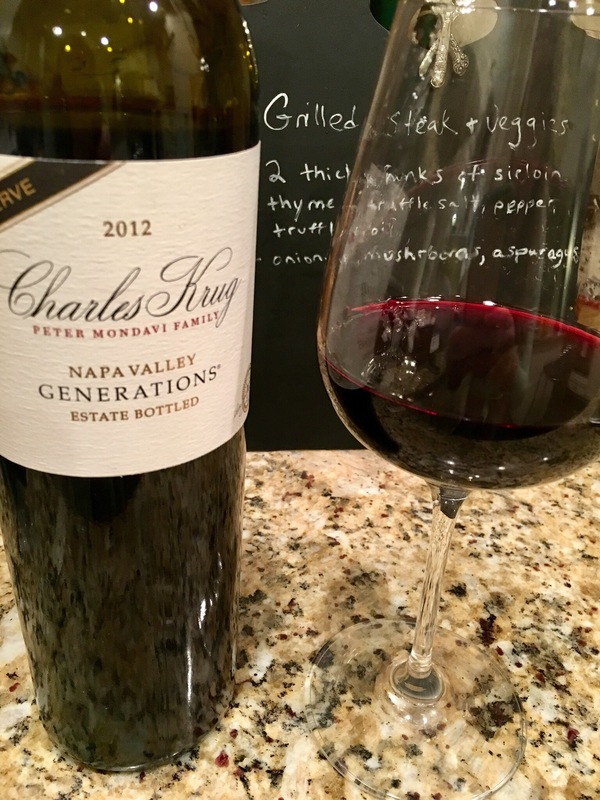 I paired it with a lovely bottle of Charles Krug wine, the 2012 Generations red blend. It was rich, toasty, and luscious. Mostly cabernet sauvignon, it paired perfectly with the steak. And I used my new wine gadget to open it – the Coravin. This thing is awesome. I saw it in Napa last summer and didn’t think I needed something so expensive, but I was mistaken. It lets you just have one glass from a bottle you wouldn’t necessary want to open (like on a night you’re not sharing a bottle with others or if you don’t think you’ll finish the bottle soon). Look it up if you have some big ticket bottles. It wasn’t nearly as hard to use as the Ikea-like directions made it look! 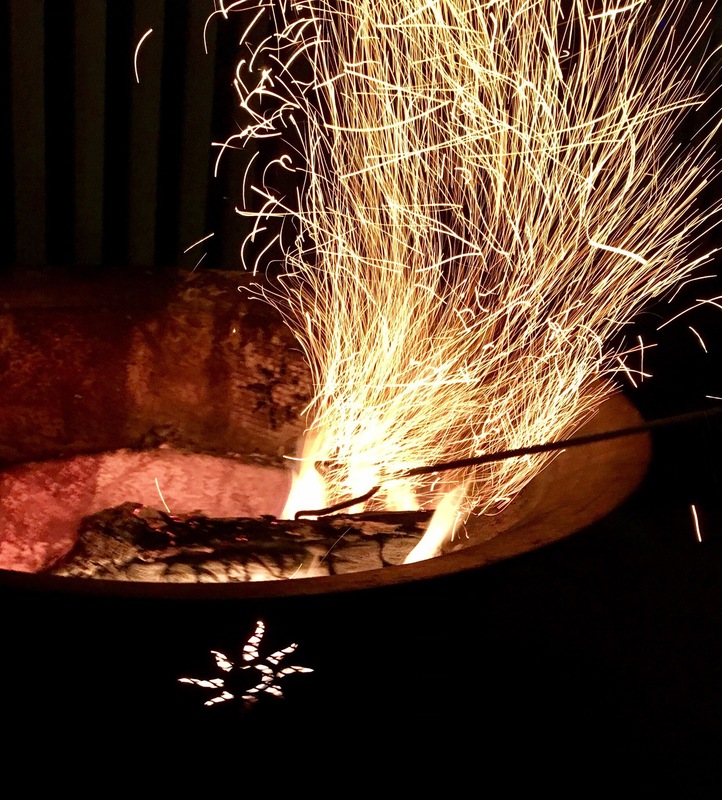 Then we had a crackling fire in the fire pit afterwards! Great night!